Canola crop in Eastern Washington. Photo by Karen Sowers, WSU Extension. 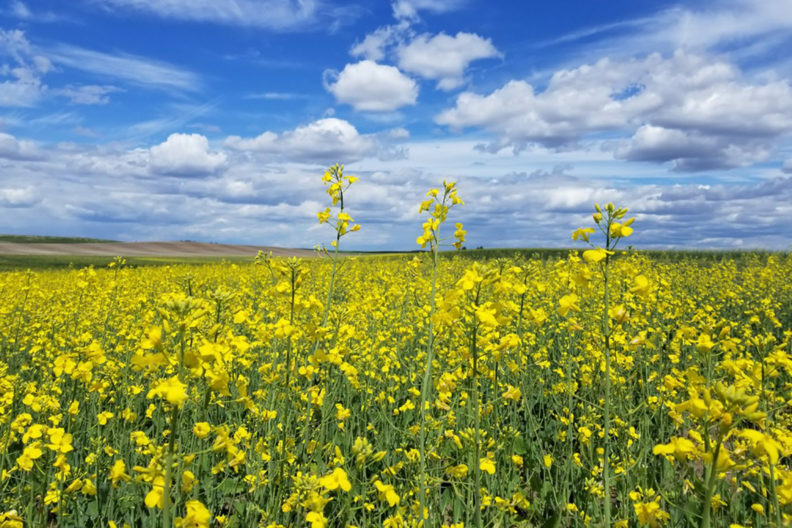 The Washington Oilseed Cropping Systems project is hosting their annual Oilseed Workshops, scheduled for Jan. 23 and 25 in Eastern Washington. Wednesday, Jan. 23, at the Wilbur Community Center, Wilbur, Wash.
Friday, Jan. 25, at the Quality Inn & Suites Conference Center, Clarkston, Wash. The keynote speaker at both workshops will be Caydee Savinelli, National Pollinator and IPM Stewardship Lead from Syngenta (North Carolina). Savinelli will address the latest research results from pollen and nectar studies, regulatory updates on seed treatments, Operation Pollinator, and more. Panel presentations include equipment manufacturers, seed company and university canola breeding program representatives, oilseed buyers and processors, and canola producers from the PNW and around the U.S. and Canada. Multiple breakout sessions will feature discussions by regional, national and Canadian growers, industry and university faculty. Researchers from Washington State University and the USDA, and collaborators across Washington state initiated the Washington Oilseed Cropping Systems study in August 2007 to evaluate alternative crops that may have the potential to meet some of the increasing demand for biofuel production. Both workshops will have a focus on stand establishment of spring and winter oilseeds, with topics including diagnostics of residual and drift herbicide injury on live canola plants, fertilizer management, harvest tips, plant growth regulators, managing volunteer and regrowth canola, and more. The sessions are designed for those just learning how canola works in a wheat rotation, as well as for farmers with years of experience. There also will be opportunities for networking throughout the day. Pesticide credits have been received from Idaho, Montana, Oregon and Washington. Registration, agendas and other information is available on the Washington Oilseed Cropping Systems website. Advance registration is $20 and includes lunch and refreshments. Each workshop will be followed by an industry-sponsored social. For information, contact Karen Sowers, extension and outreach specialist in oilseeds, 808‑283‑7013, ksowers@wsu.edu. Please share this email and information with others who may be interested. Karen Sowers, Extension and Outreach Specialist in Oilseeds, 808‑283‑7013, ksowers@wsu.edu.